The Panzer III Ausf J was the first variant of the tank to be built to have the armour protection increased to a basic 50mm (1.96in). The armour change required new fittings. In addition, an improved driver’s visor was fitted, plus a new ball-shaped hull machine-gun mount. The upper hull front accommodated newly designed air intakes for brakes and final-drive cooling, while single-piece access hatches in the glacis were fitted in place of the double hatch. The initial order for the Ausf J was for 900, but this was later increased to 2700. The new vehicle, with its 50mm KwK L/42 gun, was used to equip the 2nd and 5th Panzer Divisions, plus an independent panzer regiment. 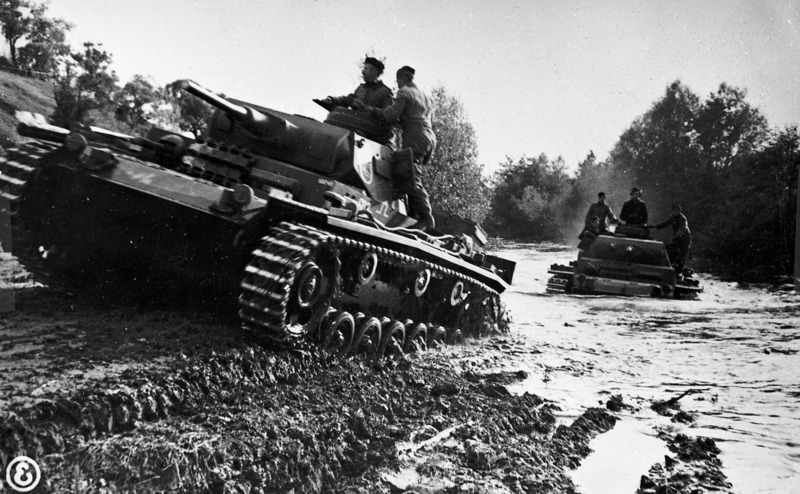 These units were sent to the Eastern Front in September 1941, where they took part in the later stages of Operation Barbarossa, the German invasion of the Soviet Union, suffering many losses (their engines and suspension systems suffered in the freezing conditions). The rest of the Ausf Js were used as replacement vehicles for the 1400 Panzers II tanks lost during the first year of fighting in Russia and North Africa. Though the Panzer III was outclassed by the T-34 in the East from the end of 1941, there were still 500 KwK L/42-armed Panzer IIIs in service at the beginning of the German summer offensive in mid-1943.